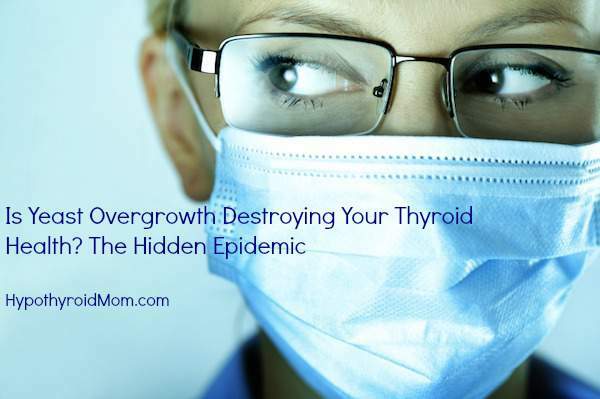 Did you know your gut microbes could be dramatically affecting your thyroid health? Hey guys!…this is not just for women. Men, too, commonly suffer from intestinal yeast overgrowth or fungal dysbiosis! Every day we see new research on the effects of unhealthy gut organisms on the thyroid gland, the brain, the nervous system, the immune system, and the heart and vascular system. In functional medicine, this is one reason we focus so intently on helping our patients heal their gut and thrive. Without a healthy bacterial population in the colon, it’s nearly impossible to experience the optimal health we all desire. Many people are unknowingly fighting a battle against a single-cell fungus in the gut. Its name is Candida Albicans, although in recent years there has been an increase in non-albicans species of yeast. Candida is a normal organism that is part of our skin flora, intestinal microbes, and for women, vaginal flora. Men, this doesn’t mean you can’t harbor yeast as well! This seemingly benign player can become hostile if the environment is right. High intake of refined carbohydrates and sugar, frequent antibiotic or prednisone use, hormones and birth control pills and other medications give the yeast an advantage over the normal protective bugs, like lactobacillus, so that it flourishes. It has the ability to take over and becomes invasive leading to a host of unwanted symptoms. Sadly, many conventional physicians do not recognize that the gut can be a reservoir of these fungal organisms. If you have ever experienced vaginal yeast infections, rectal irritation, white coating on your tongue called thrush, or any fungal skin or nail infections, like onychomycosis, you may also have a large number of these buggers living in your gastrointestinal tract. One of the most important things that I notice with patients who have fungal dysbiosis is the feeling of being tired and “run down” all the time with intense cravings for sugar or carbohydrates. Many patients don’t believe me when I tell them that if their gut is healthy, they will get to the point of having no food cravings at all! It’s really true! And if you are still experiencing intense, uncontrollable cravings, binge eating, or other issues in a love-hate relationship with sugar and refined carbohydrates, you can bet there is a problem with your gut microbes! Take this quiz to find out if YOU have a problem! These are common symptoms that may occur with yeast overgrowth in the gut. Keep in mind, these are not specific to yeast alone, but if you experience them on a regular basis you are likely to have a real problem with fungal dysbiosis, or yeast overgrowth. If yeast becomes dominant in the gut, it may take over and overwhelm the good bacteria. This is called Fungal Dysbiosis. The situation becomes dire when yeast or abnormal gut microbes proliferate and dysbiosis occurs. The problems start when yeast changes from a benign one cell organism to the more invasive hyphe form. These forms can secrete enzymes, like proteases and phosopholipases that break down cell membranes and contribute to intestinal permeability or “leaky gut”. As the gut becomes more permeable, toxic metabolites, such as acetaldehyde, leak into the blood stream and cause symptoms such as brain fog, fatigue, or depression. Did you know that this chemical yeast produces can make you feel hungover? Alcohol, when metabolized by the liver, also produces acetaldehyde which causes that “hangover” feeling. The yeast bugs also drive cravings for the very foods that allow them to survive –sugar, refined carbohydrates and sometimes fermented foods or alcohol. I’m always amazed by the number of people who struggle with alcohol craving or addiction that have yeast overgrowth in their gut. In addition to the toxic materials that leak into the blood stream, partially digested food may also leak through the lining of the gut and create food sensitivities. Many people with chronic yeast overgrowth will experience sensitivities to common foods, like gluten, dairy, sugar, corn, and soy and may even experience improvement in symptoms when they go on an elimination diet. Yeast also produces more than one-hundred other toxins that may leak into the blood stream and affect thyroid and hormone function, brain function and even neurotransmitter production. So What Causes Fungal Dysbiosis? Here are some of the most common factors that upset the balance of gut microbes and contribute to yeast overgrowth or fungal dysbiosis. Eating too much sugar and too many grains. Sugar is the main fuel for yeast. Taking antibiotics, which kill both your good and bad bacteria. How Does My Doctor Diagnose Fungal Dysbiosis? By combining a patient’s symptoms with the testing above, it becomes relatively easy to determine if a patient has fungal dysbiosis or not. Other red flags are someone with inflammatory bowel disorder or other bacterial dysbiosis, such as SIBO (small intestinal bacterial overgrowth) as the two can co-exsist. *You can also order your own lab testing online for Organic Acids and Comprehensive Stool Analysis with functional medicine doctors who provide one-on-one results reviews. So Tell Me How to Get Rid of It! Chose organic, free-range meat and be sure they do not contain added growth hormones or antibiotics. I advise all patients to avoid cow’s dairy due to lactose content, which is a sugar that yeast likes. Avoid all dried fruits and fruit juices. Stevia may be used to sweeten teas and beverages. You may need to eliminate fruit in the beginning or at least stick to no more than one serving of low-glycemic fruit per day – best bets are berries, green apples, or citrus. You should also eliminate the following: alcohol; vinegar (and anything containing vinegar, like salad dressing and sauces); all bread (which contains yeast); high starchy vegetables, like carrots, potatoes and beets; peanuts and corn (due to high mold content); mushrooms (fungus); and aged or moldy foods, like blue cheese. Drink plenty of purified water daily. If you are feeling dizzy, add some electrolytes (ElectroMix or Elyte Sport) to your morning water. Get some form of daily exercise (walking, hiking, yoga, bicycling). Pick an activity you enjoy and try to get in 30-40min every day. Make time for rest and relaxation. Epson salt baths can be especially helpful for the yeast die-off symptoms. Use 2-3 cups of salt in warm bath and soak 20min. Dr. Jill Carnahan uses functional medicine to help you find answers to the cause of your illness and the nutritional and biochemical imbalances that may be making you feel ill. Functional medicine is personalized medicine that deals with root cause of disease instead of just treating symptoms. Dr Jill will search for underlying triggers that are contributing to your illness through cutting edge lab testing and tailor the intervention to your specific needs as an individual. Dr. Carnahan’s office FLATIRON FUNCTIONAL MEDICINE is located in Boulder, Colorado. How long do you stay on the retricted diet above? Thanks for the info!